The welcome you receive in Quelb is somewhat less than warm. All of the shops are locked and the city appears deserted save for a few roaming sheep. You can’t really blame their absence. After all Exdeath is on the loose again bent upon the world’s destruction. In the northern manse you find the first signs of life. Enter the house of Kelger. Once again you face a locked door to the next room, but upon exiting you meet the master of the house. 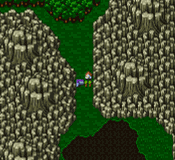 After quelling Kelger’s fears Bartz learns a bit about his past and his connection with the Four Warriors of the Dawn: Kelger, Galuf, Xezat, and Dorgann. Kelger grants passage to the north, but before you go, wander about the city. The citizens have come out of hiding and peddle their finery. If you purchased all of the weapons from Regole and the Castle of Bal, the weapon-smith on the right is a tremendous disappointment. Fortunately this time there are two weapon-smiths. The smith on the left carries three new weapons. The Kodachi, which can be wielded only by ninjas or freelancers, has an atk of 43 but otherwise doesn’t do anything special. The Killer Bow instantly kills its target when it scores a critical hit. The Poison Rod poisons its target. In addition to these lovely weapons the smith stocks Shurikens and elemental scrolls for your ninjas. Like the weaponry, the armory employs two merchants. The rightmost armorist’s inventory sells garb you’ve seen before whereas the leftmost armorist carries three new items. The Twist Headband, a light helmet, increases its wearer’s str by 3 and def by 6. Its only competition is the Green Beret, which adds 1 to agi, but can’t compare in the defense department. The Power Sash amazingly enough increases its wearer’s str by 3. It has a def of 11 and doesn’t weigh anything at all. The last new bobble for sale is the Power Armlet, which you may have stolen from the Abductor outside of Bal if you were extremely lucky. The ring also increases your str by 3. Your party is going to be much stronger at the end of this shopping spree. The farther you travel from civilization, the more expensive a clean bed becomes. The inn at Quelb runs 60 Gil per night. Stop in even if you don’t fancy a nap. In the back room a wolf serves a tantalizing meal that heals your entire party. As an added bonus he rewards the party with 8 Potions after you dine with him. You may enjoy three meals before you eat them out of house and home. You know the drill: buy whatever you think you may need. The two shops sell the same items the previous two shops stocked. You may want to stock up on Maiden’s Kisses. There are many frogs in the area. If you don’t normally talk to all of the townspeople, there are at least two you should go out of your way to converse with. At the northeast corner of town three wolves run around. One of them has nothing to say. The other two pray for your safety. One of the praying wolves offers up more than a prayer. He offers a song as well. When you talk with him he bestows Requiem on your party, which comes in handy in the Drakenvale. The other person you need to speak with is lurking down the well. Examine it to hear the ghostly call “F̴r…og…” Out will pop a purple mage. He asks you to bring him a frog. If you feel like granting his request, exit the city. Make sure you have a beastmaster or someone with the ! Catch ability. Walk until you encounter a Kornago. Whittle the Kornago’s hp down to the required 1/8 or 125 hp using Gravity. This frog has a nasty habit of running when he feels threatened. To allay much frustration cast Sleep or Stop on him. Once you capture the Kornago return to Quelb and speak with the mage again. He offers to trade you a Kornago Gourd for the frog and 10,000 Gil. It’s a pricey trade, but you can’t buy the jar anywhere else. You can obtain one as a rare steal from Omniscient in Fork Tower but this is a much easier alternative. Death Claw is also useful for capturing a Kornago, although it does not always hit. Gravity and Graviga are both spells in Final Fantasy Advance thank you very much. Use whichever you have. Since you don’t get Graviga until Moore Village I tell you to use Gravity. Perhaps my wording is obtuse. Gravity reduces by half, Graviga by 7/8. The verb whittle (imo) implies multiple castings of Gravity, which is the intended meaning. foxbuster you moron why dont you try it before commenting, i used gravity and had frog down to 125 in about 3 or 4 hits. "Whittle the Kornago�s hp down to the required 1/8 or 125 hp using Gravity" Wrong. It's Graviga, not Gravity. The easiest way to nab a Kornago is to use Death Claw on him. Not only does this reduce his HP to single digits, but it also paralyzes him, so you should have time to Catch him before he runs. Posted at 3:12 PM on December 26, 2006 by Josh G.
Talk to one of the wolves running in circles in the northeast corner of town.